Justify proudly, majestically pounds the dirt. 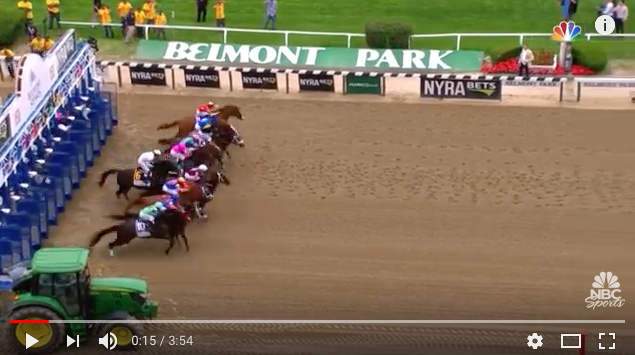 We watched the Belmont Stakes on Saturday, and came away with a shiver as Justify fiercely and powerfully pounded across the finish line one and three quarter lengths ahead of his closest opponent. Was it because the 3 year old just won the Triple Crown? Because he proudly stands 16.3 hands high and weighs in at an amazing 1,380 pounds? The $1,500,000 purse? Because he’s a fifth generation descendant of Triple Crown Winners Omaha, Seattle Slew, Secretariat, Count Fleet and War Admiral? His $3,798,000 winnings history? Because he was loudly and jubilantly bestowed the laudable praise of immortal? No. We came away with a shiver because he almost lost to Gronkowski. 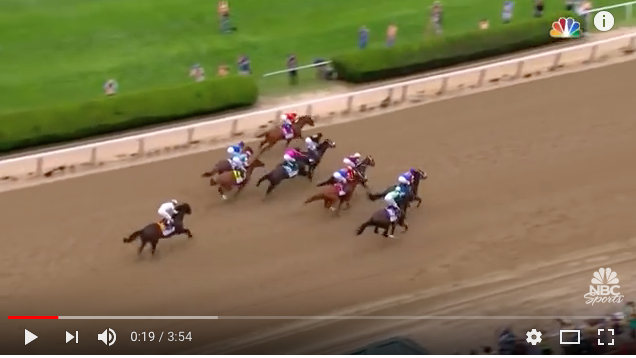 If you watched the race you may have lost track of Gronk as the race unfolded, and that is excusable, because absent the use of a wide angle lens, you would not see the trailing horse in the same frame as the 9 others. He barely made it out of the gate. At the gate, Gronkowski, ridden by Ortiz in white is delayed. Gronkowski is a lesson in accidental fortune. 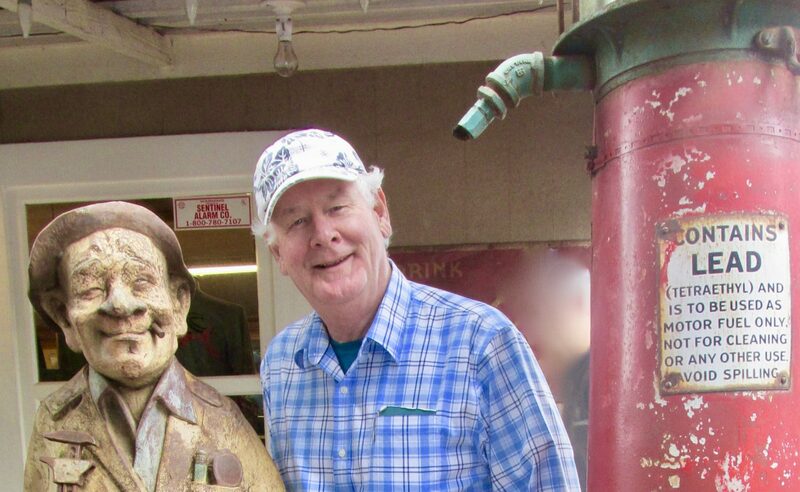 With a meager $79,496 in winnings to date, he did not inspire much confidence as a good bet. 12-1 on race day. 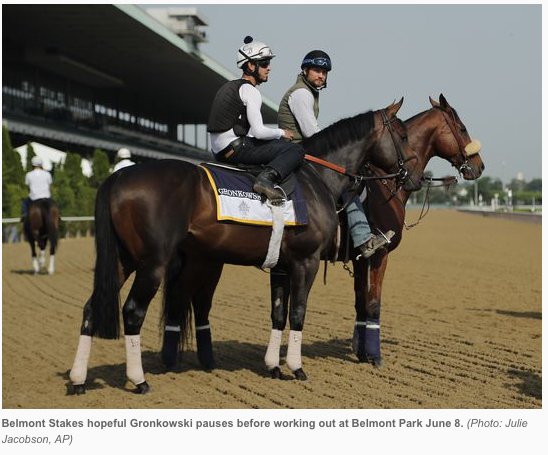 Nevertheless, on a whim, New England Patriots tight end Rob Gronkowski recently bought a share in the horse, solely because they shared the same name. Ah, the joys of personal disposable income! The football player weighs 265; the horse is over 1,200. Barely 10 seconds into the race Gronk falls back. As the race begins, Gronkowski the horse breaks out of the gate dead last. Only a length behind, he is now eyeing 9 horses’ butts in front of him as he appears to awaken from an afternoon’s equine slumber. This would be the moment to double back, and check if he is in the right race. Instead, Gronkowski shuffles into a gallop, no doubt looking to see what the kerfuffle is up ahead. For the next minute he meanders in the dirt backfield waiting for a sign from his rider, Jose Ortiz. The gap widens. Can we point the camera elsewhere? At the first quarter mile, Gronk is in 10th place, 14-3/4 lengths behind you know who. Meanwhile, at the front of the pack, with intrepid speed and power Justify stretches his lead, thundering ahead of some hopeful contenders. All the while Justify and Mike Smith, his 52-year-old rider, soar around the bend, never looking back, confident of their win. They are truly a remarkable, thrilling sight. At one mile, Gronk is in 9th place, 8-1/2 lengths behind Justify. Still, there is a change coming. The message somehow got through to the colt that this was a horse race, and there are terrific upsides to winning versus heading back to the stable. It is amazing to watch as one by one, Gronkowski slips into the middle of the pack, and nudges his way up the rail like an impatient Target shopper on the way to self-check out. At mile one, Gronk creeps up on the inside. As the mob of horses approach the final bend, there is a quarter mile to go. Gronk has smoothly worked up to 3rd place, 2-1/2 lengths behind. 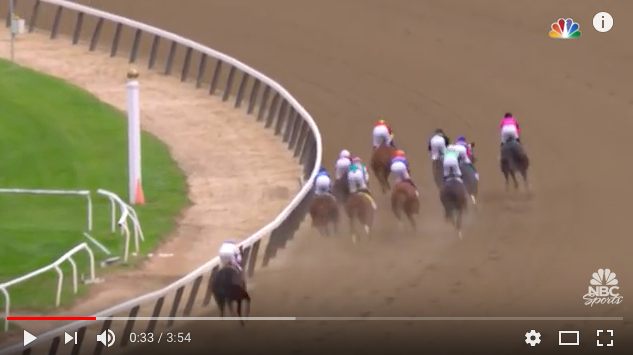 Then in the final straightaway, the crowds are on their feet, the announcer is screaming into the mike, and Justify stretches forward like a wild dragon on fire, closing on the finish. While horse and rider don’t look back, they surely can hear amid the crowd’s roar the fierce pounding of another set of hooves. 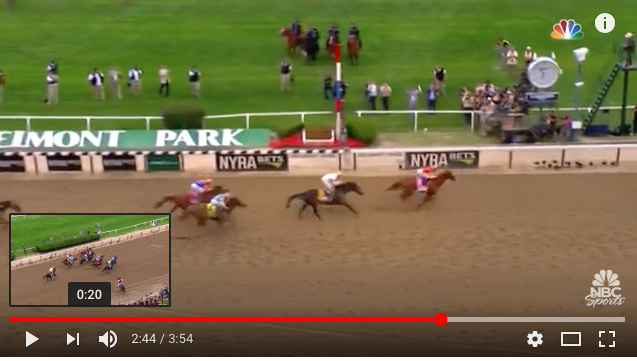 The finish, hot on Justify’s tail. 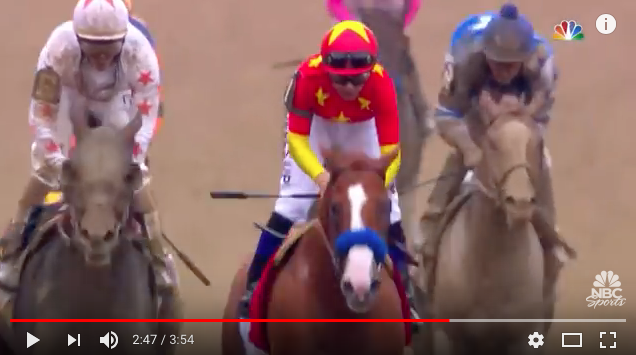 Alas, Justify crosses the line, victorious, and doesn’t know who crept up behind him in the last few seconds. It was Gronkowski, who came in second, a third of a second behind Justify’s 2:28:18. True, it’s a horse race that astounds: it is loud, hot, wet, dirty, fast, scary and dangerous. 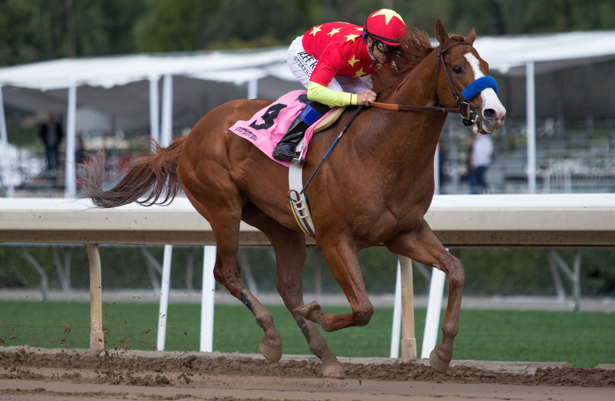 Justify completed his race with a time speed of 36 miles per hour. 53 feet per second. 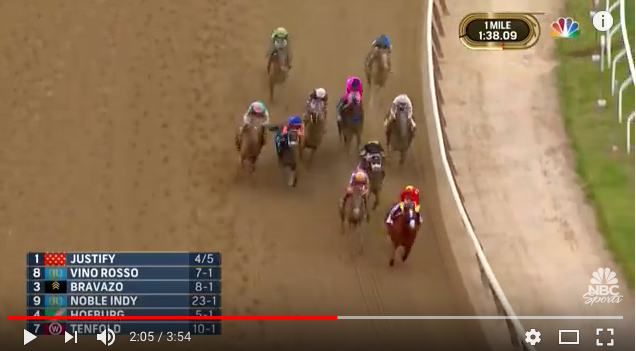 But Gronkowski only woke up half way through the race, so he actually sprinted faster than Justify through the last half mile. These horses love to run, and some even love to win. Gronkowski in socks, at a quieter moment. → How High’s The Water? You never forget. Thanks friend. Gronkowski is just as amazing as Justify. When you place second, you have to try harder! You had me on my feet, Phil! Two great horses, one, only recently discovered! Phil—- I don’t follow horse racing, but you made it a thrilling story for even me. Hi Grady! The horse was all heart and competitive pride…it just slept in a little late!